TAMPA, Fla. -- Graduating Senior Christian Quintero didn’t give himself any time to transition from the military to USF -- literally. He was discharged, received his DD214 papers and jumped into a car. Within 14 hours of leaving the Navy he was on campus ready to start classes. The USF Office of Veterans Services took care of what time could not -- in the form of wise counsel and the opportunity to be among people who understood the world from which he came. Quintero’s fellow veterans -- including USF staff and fellow students he met in class and at the Veterans Achievement Center -- gave him some of his most valuable and useful advice. An important required class helped, too. Quintero’s experience at USF touched on the three areas the Office of Veterans Affairs seeks to impact: “academic success, professional growth and meaningful employment.” From his perspective as director of the Office of Veterans Affairs, Lawrence Braue looks upon him with admiration and a sense of accomplishment. Quintero earned this respect simply by living up to his own high standards and making use of what Veterans Services had to offer -- from the very beginning -- from that first class. “We were taught the importance of networking,” Quintero said and he put that lesson to good use. In fact, that’s how he found his first public relations job and the job he has now. From there, advancing his career a year-and-a-half later, Quintero networked to his current job working with the U.S. Geological Survey (USGS) collocated in Lutz and Virginia. Between that first day on campus and commencement this Saturday, Quintero worked full time, attended school full time and managed to build a home life with his wife and their young son. That’s where the Vet Center came in handy once again -- when things started becoming overwhelming. Guidance was what he needed, carrying a full load of courses and aiming for straight A’s in each one. Now graduating in the top 10 percent of his class and invited into the National Honor Society Kappa Tau Alpha, failure was really never an issue. Being tough on himself was. “In the military, I was used to just getting the job done no matter what and I brought that way of thinking with me,” he said. Quintero’s interest in science at Miami Sunset Senior High School led him to focus on becoming a surgical assistant in the U. S. Navy’s hospital corps based in Bethesda, Md. He had planned to stay in the Navy until the cumulative effect of close to five years active duty -- having treated thousands of wounded veterans from Iraq and Afghanistan and a tour in Haiti where he was part of the humanitarian mission following the 2011 earthquake -- gave him pause. Aboard the USNS Comfort, he was barely in Port-au-Prince before diving right in to work nearly non-stop on more than 1,500 surgical cases during a three-month period. What made it particularly difficult for him was that he was away from his family when his son began to crawl. Though still in the Navy Reserves, college became his next challenge. After his first semester he decided on a career in communications largely because he likes interacting with people. Quintero is graduating with a major in public relations from the School of Mass Communications. The job he has now taps into his interest in science as well as his desire to work in the public service arena. As a public affairs specialist, he works for the USGS headquarters in the office of communications and publishing. His agency is tasked with managing water, biological, energy and mineral resources and providing reliable scientific information about the planet -- a great fit. And he’s putting that lesson to good use now, too, working in cooperation with his wife Lara, a nursing student who he met in the service. Rivera, who serves as assistant director of the Office of Veterans Services, has been impressed with Quintero's work ethic and his sense of responsibility. "Christian is one of the best student veterans that I have had the pleasure of meeting here at USF,” Rivera said. “Right from the start, we were able to connect not just from our experiences as veterans, but also as a student and as a family man." Quintero's wife, son, parents, siblings a cousin and several friends will be on hand to watch him walk across the stage at the USF Sun Dome. “I'm really excited about this because they have all, in one way or another, supported me throughout this long process. My wife especially has helped me tremendously and she is a big reason of why I have been so successful. 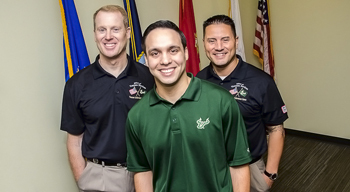 For more information about USF’s Office of Veterans Affairs, call 813-974-2291 or email vetserve@usf.edu.